Leading Manufacturer of hdpe pipe fittings, hdpe tee and 63 mm hdpe sprinkler irrigation pipe from Patna. With our wide industry experience, we are manufacturers and offer a superior range of high quality of HDPE Pipe Fittings to our respected clients. Now we make available to our client's wide array of HDPE Pipe Fittings that is simple in construction and easy to operate. These HDPE Pipe Fittings are made of a high-grade raw material that provides flawless performance and long-lasting facility. We have complete allegiance in developing best in class HDPE Tee Fittings. Our offered fittings become synonymous to trust, as we make sure to use the best-suited inventory of raw material. 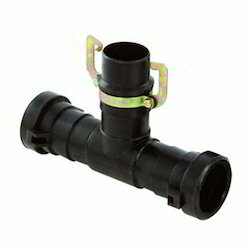 The offered fittings are used for directing the flow of water in irrigation systems, hence we make sure to use injection molded technique with insert molding to give a leak-proof riser pipe connection. Further, our prestigious clients can avail the fittings from us at a nominal price. We have been recognized amongst the leading organization engaged in manufacturing and supplying 63 mm HDPE Sprinkler Irrigation Pipe.